Read excerpts from the book on-line! 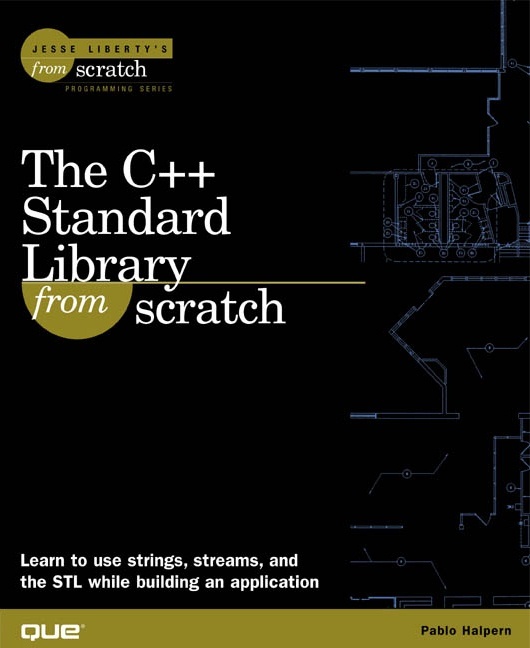 The C++ Standard Library From Scratch walks you through the analysis, design and implementation of a functioning personal information manager (PIM) using strings, streams, and the Standard Template Library. You will learn all the critical programming concepts and techniques associated with the Standard Library in the context of creating a working application, the "TinyPIM" address and calendar application. Every example builds the application throughout the book. In the end, you will have created an application that allows you to track contacts, sort addresses, and enter events and appointments. Use the Standard Template Library to create a functioning Personal Information Manager (PIM) application. Concept Web illustrates the architecture and interrelationship between concepts and techniques. Web page contains complete application, quick reference to The C++ Standard Library, exercises and solutions, errata and links. Note: The Web sites for some on-line retailers describe a companion CD-ROM. This information is incorrect. This book has a support Web site, not a CD-ROM. The Web site is regularly updated by the author.